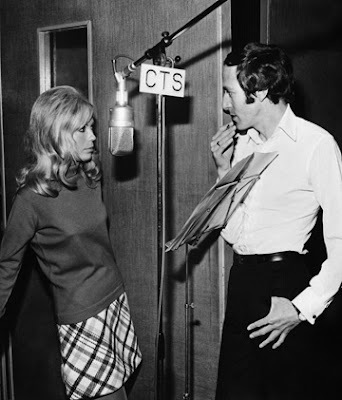 Nancy Sinatra and John Barry. Rest in peace, Mr. Barry. 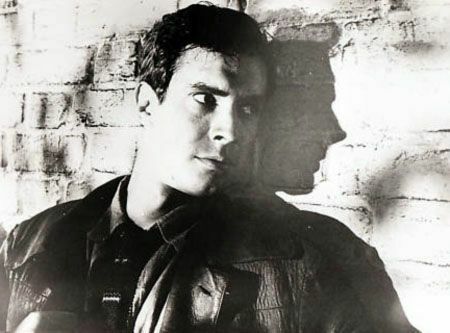 Guest Blogger Emm on "Bradford Dillman...and the 'Impossible' Coolness Thereof"
This guest post for the Bradford Dillman Celebration comes from Emm, currently on a break from blogging (AND WE MISS HER!). She is reviewing Bradford's first appearance on Mission: Impossible. I have actually never seen this episode (THE SHOCK AND HORROR! ;-D). But, after this review, I am definitely checking it out! Sounds awesome! Also the awesome glasses. ;-D Thanks for the wunderbar post, Emm! Let us proceed with our tale of spyishness and psychological warfare with brilliance abounding at every turn. An American bomber crashed behind the Iron Curtain, but the fail-safe mechanism didn't explode for inexplicable reasons. 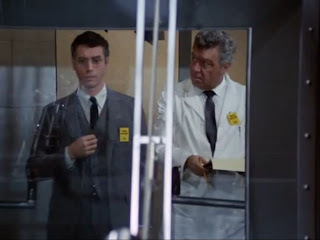 If Paul Shipherd (defector/evil genius/brilliant physicist/Bradford Dillman) manages to disassemble it, he'll learn the secret to the entire fail safe system, thus placing the Free World in dire jeopardy. And trust me, you definitely don't want to let The Dill Man in on any of your secrets unless you harbor some ideas about destroying life as we know it. Though he chose to defect years before, Shipherd is clearly insecure and uncomfortable with no longer being an American citizen. Tiny details reveal his deep-rooted obsession with the United States, and contact with Americans visibly rattles him. He's also somewhat sensitive, though coldly-calculating and heartless. And he has this very creepy little habit of adjusting his glasses whenever he acquires a tidbit of information that helps to further his brilliantly evil schemes. Of course, because this is Mission: Impossible, The Dill Man can't hope to triumph. But he'll try very hard all the same. Cue evil, terrifying, Bradford-Dillman-smile. Step 4: Force him to open the fail-safe. Never mind if it kills him. Little does The Dill Man know he's being completely manipulated by people even cooler than himself who will make him into the spitting image of Martin Landau and smuggle him back to the United States. But not to worry. He completely deserves it. Watch the entire episode: YAYA! Recently, in the gift shop of Thomas Wolfe's home in Asheville, North Carolina, I read the following in the preface to his Mannerhouse, a play that was staged but once: "In 1949 it was performed by the Yale Dramatic Association, a wretched experience endured patiently by small audiences." I remember. I enacted the leading role, a character Wolfe based on himself. I simply must quote again from Bradford Dillman's IMDb biography, which states that he "possessed charming and confidant good looks that were slightly tainted by his bent smile, darting glance and edgy countenance that often provoked suspicion." Many actors have a defining characteristic, something that is uniquely "them". This characteristic can be both integral to the actor's image...and difficult for the actor to overcome. For instance, Marilyn Monroe found it difficult for anyone to think of her in any way but as a "dumb blonde". For Bradford-- it's difficult to think of him as anything but an evil genius. 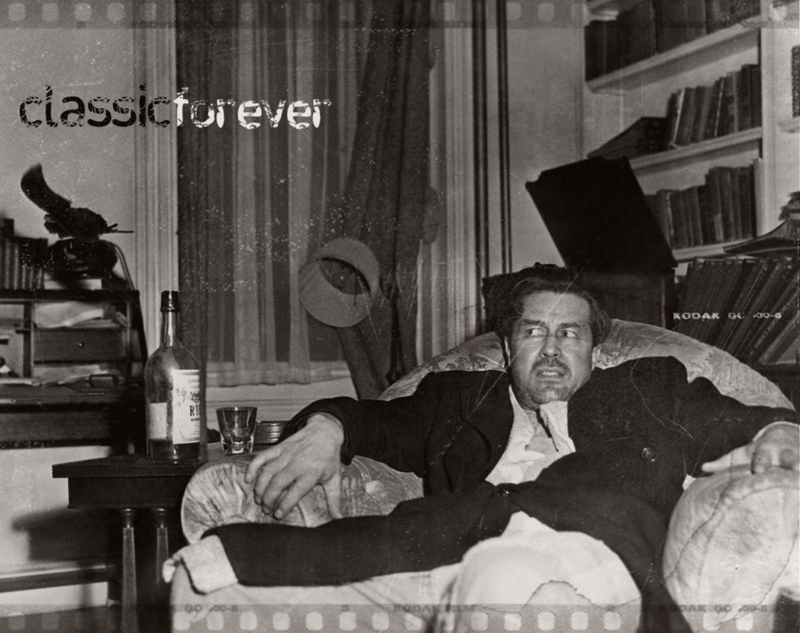 And that's because he always played such brilliantly evil genius'. And that's also why one can never trust him as a non-evil genius. He played quite a few non-evil roles, but you never know for sure that he's not evil until the end of the movie/TV show. With Bradford, you always want to give him the benefit-of-the-doubt that he IS thoroughly and completely evil and probably runs over old ladies with his car for fun. When Bradford plays a "conflicted character" it usually means there's a small, odd part of him that wants to do the right thing. Bradford Dillman really did have THE greatest evil smile ever. He played many different types of villains: those DRIVEN to villainy by circumstances, cold and calculating villains, desperate villains-- whatever. But, his awesomest roles of villainy were his gleeful, over-the-top, brilliantly evil, genius villains. Those villains smiled because they simply liked being evil! And that's why it's difficult to let Bradford be non-evil. Because you can't tell. What is there to distinguish from Bradford's "I'm a nice guy" smile and his "I'm currently pumping toxic waste into the drinking water of several major U.S. cities" smile? Nothing. And THAT is exactly why he is so stupendously amazingly cool. He's brilliant and can play any role. But, he NEVER plays a role stereotypically. He never plays an ordinary straight-forward anything. He can't play an ordinary old nice guy anymore than he can play an ordinary old bad guy. All of his performances are complex and unique. Anyway. 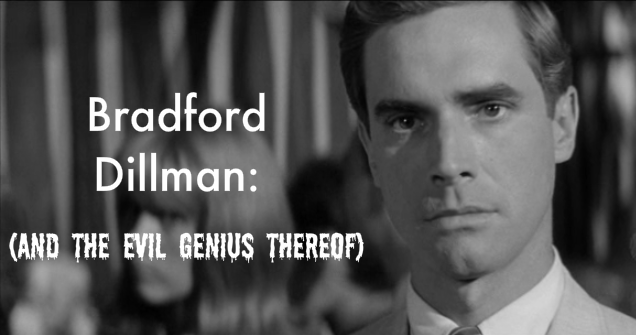 I am a big fan of Bradford Dillman and especially his seriously cool evil smile. My mother had a friend who was never convinced I had talent. Being close to the family, she worried that one day I'd be found out and never work again, leaving my children to starve. 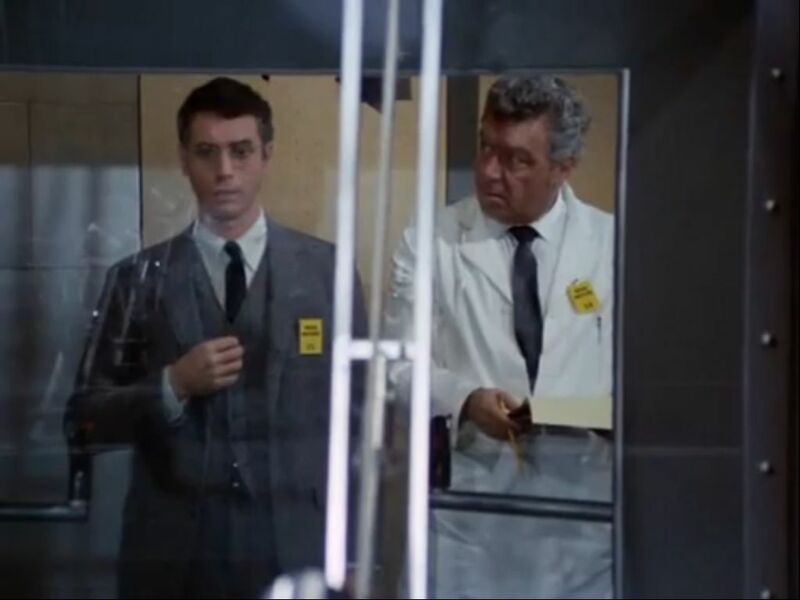 I appeared on an episode of Mission Impossible as a bad guy targeted by the Missionaries for infiltration. The man of many faces, Martin Landau was appointed to impersonate me. It was an easy week for Marty. After stirring up the plot he got to go home and play with the kids, until the final scene, when he peels off a mask revealing his disguise. Of course, for me it was a full week because I was the guy impersonating Marty, impersonating me. My mother's friend viewed the episode and was quick to call. "I hope when you did the show you were watching Martin Landau. Now, there's a great actor. You can learn from him. He was more like you than you!" "Villains don't have these problems. Me, I've never been bothered in a bar or boite. People can't be sure I'm not carrying a knife or gun." 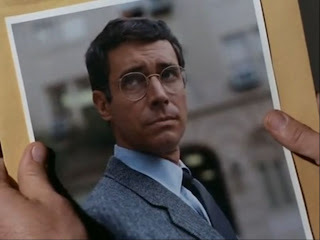 You Should Be A Bradford Dillman Fan. I have some essays to write tonight, BUT TOMORROW. It's gonna be a party. Non-stop. To kick-off this festival of evil genius I wanted to post some links to Bradford stuff you can watch online. FOR FREE. (I try to go through life only paying for things like locally made tofu and my beloved cherry honey Ricola). There is actually quite a nice sample of Bradford Dillman television appearances available online. And although it doesn't even BEGIN to cover his EXTREMELY extensive career, the sample of performances available shows a striking range of roles. Bradford Dillman simply doesn't play the same character more than once. EVER. Bradford Dillman in Mary Tyler Moore Show. See, he does comedy just as brilliant as crushing drama. He's perfect. Night Gallery + The Dillman = Serious Coolness....and the most frightening hairstyle I have ever seen. Now, generally-- ALWAYS-- I am not a fan of Big Valley (except for The Stanwyck who is ALWAYS brilliant), but this is BRILLIANT. 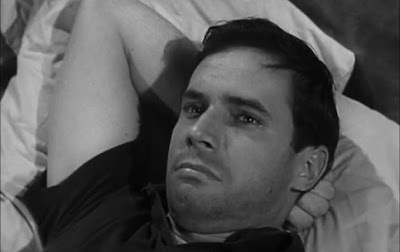 Bradford Dillman as this random, wandering, Shakespeare quoting loner-- WHO may be responsible for the death of dozens of men. BRILLIANT. Technically speaking, I wouldn't recommend A Certain Smile. Rossano Brazzi is insufferably jerky (temporarily stealing his nephew's fiance?! REALLY ROSSANO?!) and Christine Carere (who I ADORE) comes off very annoying. 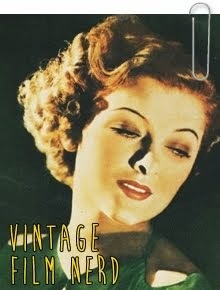 And it has Joan Fontaine (she comes out as the most sympathetic of the three, which is craziness). But, of course it also has Bradford Dillman being completely cool. And apparently doing his own stunts by driving around on a motorcycle with Christine (in his autobiography he recounts almost killing both of them on that thing....). 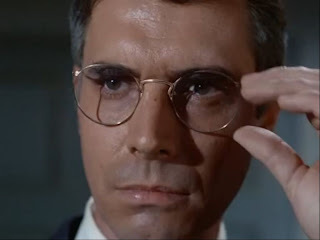 Hmm, I think this should be enough to get you started on your very own Bradford Dillman obsession; even though it doesn't include his awesome performances in Compulsion, and Circle of Deception, and The Wild Wild West (creeper mustache + gold-tipped cane that he uses to bash people's heads in. Yes.). Get to work obsessing over Bradford Dillman, my dear followers! Also: if you've got something you want to post about The Dill Man send it my way (or send me a link to the post on your blog)! EDIT: Kate made a post for the blogathon AND DREW SOME ART. THIS IS CRAZY-AMAZINGNESS! 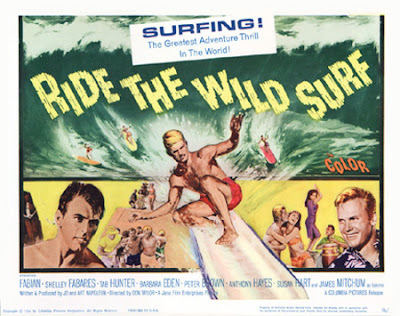 Ride The Wild Surf: A Movie Created for The Millie to Love....AND THEN HATE WITH ALL HER SOUL. "Hey let's make a Beach Party knock-off, but WE'LL have actual surfing, instead of those odd little 1ft. waves over at AIP [American International Pictures]. AND, we'll throw in Peter Brown as a surfer. OHH, and we can totally use the brilliant Barbara Eden as his girlfriend. And best of all, we'll have Jan and Dean's "Ride The Wild Surf" be the theme song. Can you imagine what a great mind-smushing semi-review we'll get from The Millie?! IT WILL MAKE OUR FILM. Oh, and by the way, we can fit Susan Hart in the movie somehow, we know how The Millie loves her because of her surfer awesomeness/native Washingtonianness." This is clearly how it all went down. THEY HAD ME IN MIND. And then something terrible happened. I can't be ABSOLUTELY sure...but it's pretty obvious Randolph Scott had something to do with the terribleness. Always annoying, but here Fabian tried to give this weird Bobby Darin mixed with Frankie Avalon impression (with some odd bit of a pathetic James Dean impersonation) . HIGHLY DISTURBING. Tab Hunter. GAHHHH! I hate Tab Hunter! Why did Randolph Scott insist on putting Tab Hunter in this movie?! And Tab Hunter kept doing his creepy Richard-Widmark-is-going-to-kill-you eyes! This was also highly disturbing. Hmmmm. There was this really boring blonde (trying to be Sandra Dee) with a famous name that I totally know, but cannot for the life of me remember at this instant. She of course was paired with Fabian. And together they made up a very bland and annoying Bobby + Sandy wanna-be couple. THIS WAS PAINFUL TO WATCH. ^This is her at her most interesting. Roger Davis showed up. Let me repeat that. THE HANNIBAL HEYES IMPOSTOR SHOWED UP. ^Look at him smiling evilly. Tab Hunter is even giving him the Richard-Widmark-is-going-to-kill-you eyes! And after Randolph Scott had done all this to the formerly perfectly wonderful film, he decided to ruin even what little joy I had. First: He took poor Peter Brown and had his hair bleached an extremely creepy platinum blonde. AND NOT EVEN ALL OF HIS HAIR. Just random parts of his hair, so that some of his hair was creepy platinum blonde and some was normal dark brown. And then Barbara Eden had dark brown/red hair....which was a little odd...but perfectly fine, because Barbara Eden would look cool even with bright green hair. 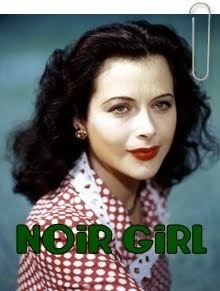 ^I don't think it's possible for her to look uncool. But, at this point, the sabotage against me....was quite obvious. Randolph Scott was out to get me. He even forced Susan Hart into being a traitor. 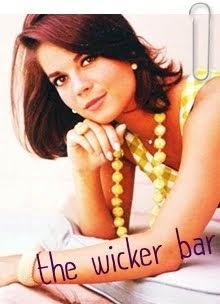 He had her poor character fall in love with TAB HUNTER. I am truly sorry Susan. All of Washington mourns with you. As I mentioned above, the surfing footage in this film is PHENOMENAL. As much as I completely adore AIP films, the surfing is pretty pathetic. I mean, they have stunt actors surfing 1ft. waves (not that I'd even be able to do that ;-D) while Frankie + Annette pretend to surf against a screen. It's awesome. But, not PHENOMENAL. Like this movie. Hmmm, well that's actually about it for serious coolness (besides the aforementioned title song). OH. I remember what I wanted to say. EXACT COPY OF HIS FATHER. It's just like the Beach Party movies with their ever-present Jody McCrea (an exact duplicate of HIS father)! There were some other surfers too, and although I can't recall their actual names, there were a couple who stood out to me. One, there was this random Australian surfer who somehow managed to mention that he was Australian IN EVERY SINGLE LINE OF DIALOGUE. It was quite impressive. Actually. *A) These two sentences make absolutely no sense. B) If you know what I mean when I say Station 51...you are seriously cool individual. ALSO: This has nothing to do with the surfers, but there was this completely creepy narrator. He would randomly start talking over certain scenes, and then he would disappear for a while...and you would forget he existed...AND THERE HE WOULD BE AGAIN. So creepy. And unnecessary. There was one scene when they were surfing and the narrator's voice suddenly appeared to say: "Makaha was just plain scary." Seriously. That's all he said. And then he disappeared again. It was just weird. (<-- "It was just weird" should be the tag-line for this movie). I swear, I NEED to seriously start watching the trailers for these movies, BEFORE I watch the movies. If I had watched the trailer for Ride The Wild Surf, I would have known ALL I needed to know. ODDLY enough, those were also my EXACT reasons for wanting to see/not wanting to see Ride The Wild Surf. (Peter Brown + platinum bleached hair is a singularly disturbing prospect). Of course I HAD to go watch it. Which is why you are reading this semi-review right now. ^Random photo of Barbara Eden because she's awesome. In conclusion, this movie started out very well, Randolph Scott became involved out of petty dislike for me, and everything went downhill. This film included a remarkable amount of actors I can't stand, a completely insufferable under-lying "seriousness", and sadly platinum blonde Peter Brown. Oddly enough, I rather liked the movie as a whole. I would almost, maybe, um, cough, cough, recommend it. I DON'T KNOW. Stop asking me difficult questions. My mind is still trying to comprehend WHY Peter Brown has platinum blonde hair. 1/20/11 - 1/23/11 .... MARK YOUR CALENDARS! Niamhy (aka: The Irish Leprechaun) of Born In The Wrong Decade and I are hosting a weekend of Bradford Dillman coolness coming up at the end of January. This mini-blogathon will consist of movie reviews, random posts, and perhaps even a video tribute...heh heh heh. The purpose of this Bradford Dillman celebration is because, quite frankly, hardly ANYONE even knows who he is (although they would almost certainly recognize his face from the many films and TV shows he's appeared in SINCE THE 50'S!). 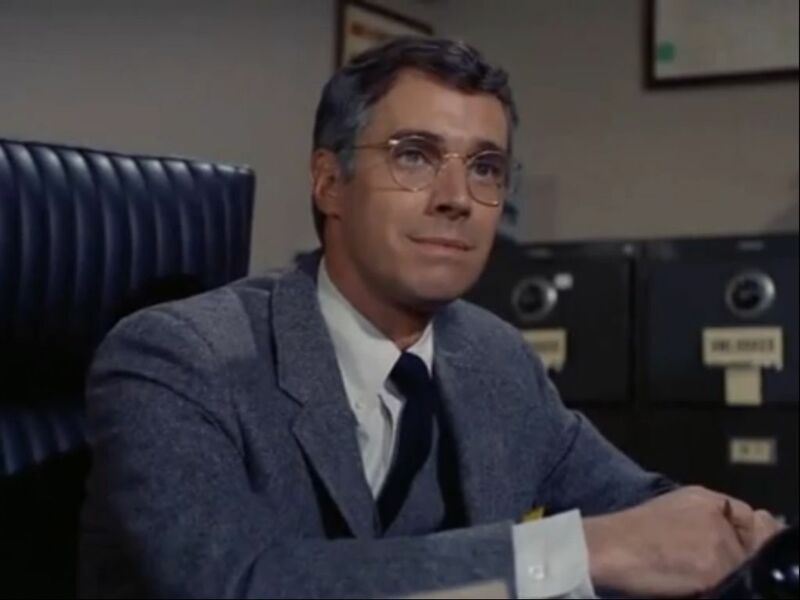 Bradford Dillman is brilliant, hilarious, originated the role of Edmund Tyrone (Eugene O'Neill's autobiographical character in A Long Day's Journey Into Night) on Broadway, AND HAS THE BEST EVIL SMILE EVER SEEN ON FILM OR TELEVISION. You should start getting excited. Now. Anne Francis was such a wonderful actress and person. And although she lived a full and long life-- her death has still come as a shock. 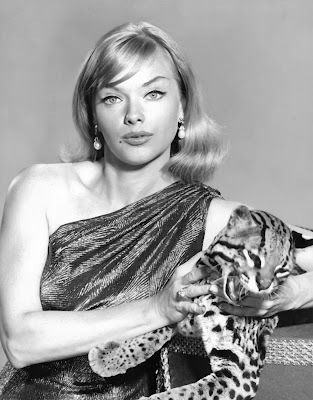 Honey West was never supposed to die. 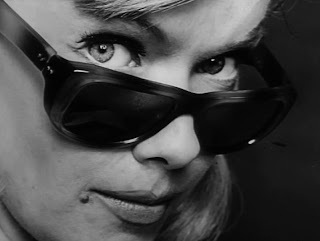 How can I put into words the extreme coolness, awesomeness, and groundbreaking nature of Anne Francis?! She starred in many films and televisions shows (her + Twilight Zone = instant classic), but she was really Honey West to me. 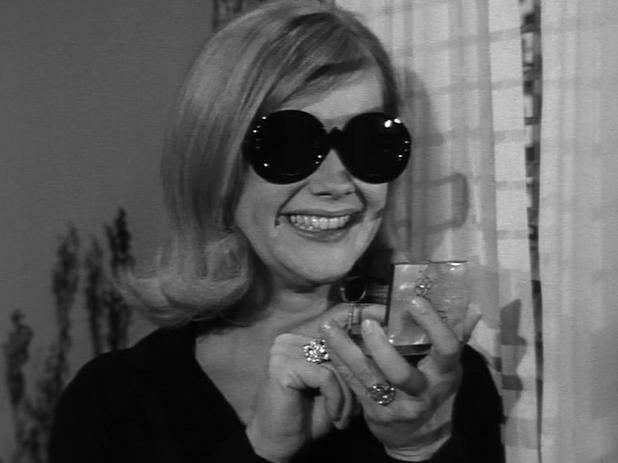 Honey West was a brilliant, but short-lived series in the 60's. It starred Anne Francis as the title character: a judo-fighting, gun-wielding, fearless private detective...with a pet ocelot named Bruce. This was a revolutionary show in America (and only just behind Honor Blackman in The Avengers in Britain). And it is awesome. Anne Francis perfectly embodied Honey West. And I hate to sound stupidly cliched, but she is seriously an icon and "role-model" for girls. She's completely "feminine" (and wears the coolest 60's clothes EVER), but not afraid to assert herself and maybe even take down the bad guy single-handedly. She's awesome. While this is a television character, it is also completely Anne Francis. In everything she ever appeared in she brought energy and coolness. 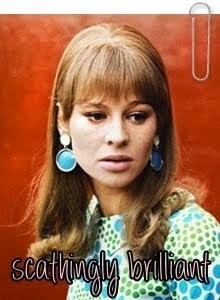 She was a brilliant actress.